In 1919 Ford Motor Company established an assembly plant in Copenhagen, Denmark. It was the second of its kind in Europe, after the one established in Manchester. From Copenhagen most of Northern Europe was supplied with the famous Ford T – the world’s first mass produced car. 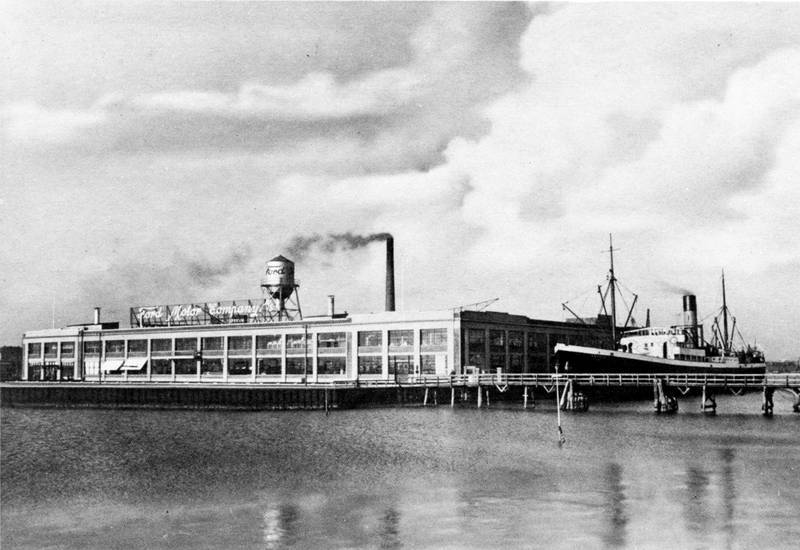 It was such a success, that a larger facility was needed, an in 1924 a new, modern factory was build in the Copenhagen South Port area. The factory was designed by Albert Kahn, the architect responsible for some of Fords most iconic industrial complexes in Detroit. Inside, the production technology also closely resembled that used in Detroit. But when it came to industrial relations, there were profound differences. In Detroit, Ford was fighting hard against any attempts by his worker to organize in trade unions, and not before 1941 an agreement was finally made with the United Auto Workers. However, in Denmark the workers were all unionized from day one, and collective bargaining was a matter of course. Ford assembly plant in Copenhagen South Habour. Photo from Thalbitzer: “Ford Motor Company A/S gennem 25 Aar”, 1944. Unknown photographer. Never the less, the production methods and –technologies introduced by Ford proved to be a challenge to the unions. Especially the systematic attempt to use unskilled workers wherever possible was felt as a threat by the craft based unions. The high wages paid by Ford was also tempering any inclination to militant union behaviour. Consequently, when the Danish management, by direct orders from Detroit, decided no longer to have a union agreement, the workers could find no common ground to fight for a continuation of the agreement. At the same time, the Labour governments in power 1924-26 and from 1929 onwards, was determinated to promote industrial modernization. This was strengthened in the 1930’s by a desire to secure and create workplaces during times of economic depression. In this context, Ford Motor Company was pointed out by the labour movement as a positive example of a job creating and high paying industry, based on rational methods of mass production. 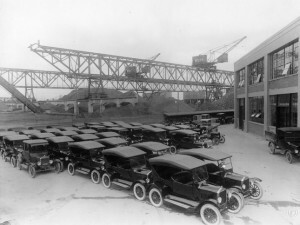 Ford T’s waiting for shipment to customers, Copenhagen ca. 1925. National Museum, unknown photographer. While the Danish Ford plant was successful from a business point of view during most of the 1920’s and 30’s, it came under pressure from larger Ford facilities elsewhere in Europe during the 1950’s. In 1966 car assembly was finally closed down, and the plant converted to producing farm equipment. I have written about the history of Ford in Denmark in the interwar years, with an emphasis on industrial relations, in an article which has been published in Labor History vol. 55 no. 3 2014, under the title “Between Denmark and Detroit: unionized labour at Ford Motor Company, Copenhagen, 1919-1939”. A PDF-version of the article can be bought from the publisher’s website. Alternatively, you may download a copy of the accepted manuscript (AKA post print) for free from here. Den foerste Ford fabrik i Europa var i Cork, Irland, hvor Henry Fords familie stammede fra. Den anden fabrik laa i Heimdalsgade Koebenhavn Noerrebro. Min far Orla Emil Larsen begyndte som kontorbud i Heimdalsgade i 1920 og blev med Ford indtil 1964 som General Sales Director for Danmark, Norge, Island/Groenland, de Baltiske lande og Polen . Jeg selv har vaeret ansat hos Ford i Tyskland, England og Canada i 9 aar indtil 1962. Tak for din kommentar – meget interessant at høre om din og din fars tilknytning til Ford. Den første Ford samlefabrik i Europa var den i Manchester, som åbnede i 1911. Ford etablerede et selskab i Irland i 1917, men startede først samlefabrik i Cork i 1919. Det var samme år som den danske samlefabrik åbnede i Heimdalsgade. Men der er den krølle på historien, at mens der blev samlet biler i København var det i starten kun traktorer, der blev samlet i Cork. Fabrikken der var faktisk slet ikke en del af bilkoncernen, men hørte under Fordson, et selvstændigt selskab som var etableret af Henry Ford mhp. traktorproduktion. Hej har hørt der blev samlet 6 Ford mustang 6 cylindre i kbh i starten af 70 erne…?? Kan man finde oplysninger om disse nogen steder. Fords samlefabrik i Sydhavnen lukkede i 1966. Så hvis der er blevet samlet Mustang’er i starten af 70’erne har det ikke været på samlefabrikken. Men min egen forskning i Ford-historien slutter også i ’66, så jeg kan ikke principielt udelukke, at du har ret. Måske kan man have samlet nogle enkelte biler som en særlig gimmick eller af andre grunde. Hvor har du oplysningerne fra – og kan du komme nærmere på et årstal? Beklager jeg havde ikke set der var svar. Mht. Mustang samlet omkring 70 så stammer oplysningerne fra en ejer af en sådan dansk samlet model. Har desværre ikke set noget på tryk der kan dokumentere samme. hvor præcis lå den første fordsamlefabrik Heimdalsgade hvilket nr.? Ingen af disse bygninger findes i dag.